In addition to the daily vineyard walking tours, we have a number of useful and interesting options. 4 Vineyards at 4 different times of year. One of the best ways to see and understand the full seasonal growth in the vineyards. Spring, Summer, Fall and Winter, or if you prefer: budbreak, flowering, veraison(ripening) and harvest. Throughout the growing cycle the vines are always a spectacular sight but when you choose this program you will see how the vines have gone through their changes. This is an opportunity of developing your ability of creating beautiful photography and cross-referencing the bare vines of budbreak to the fall colors of harvest as well. 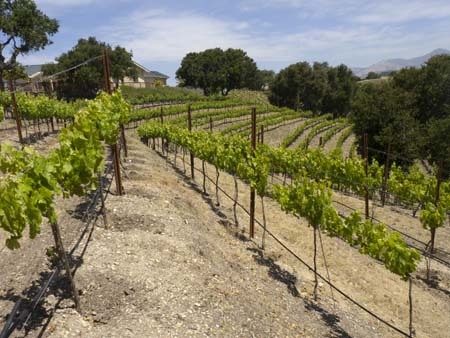 We can arrange a number of options for places to stay here in the Santa Ynez Valley. From bed and breakfast at boutique inns to loft apartments on private vineyard estates. Please contact us for more information to help you find your ideal wine country getaway. Cowboy flavor vineyard BBQ. Santa Maria-style. Join Billy and Sue Ruiz for a day in the vineyard. Learn about vines, ride a buggy and feast on their inimitable Santa Maria style barbecue. This program is for groups of over 15 and requires reservations at least a week in advance to arrange.